I realized over the weekend that I hadn't done a reflection on the previous months, so it was about time I did. This is when I start to bake a lot more and crave everything that's associated with fall. I love the changes in the weather and all that the season has to offer. The months of October & November are always full of planning, making lists and trying new recipes for me & my family. Here are some of the highlights from the past months. 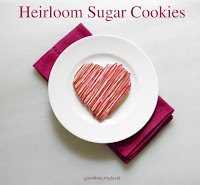 These are such marvelous cookies to bake all year round. I think they're especially good around the holidays because they contain just the right amount of spice & sweetness, so I do hope you try them soon. The picture above, shows you exactly how I roll out my cookie dough. I always lightly flour my dough counter and place a sheet of plastic wrap over the dough (usually double width). This allows me to roll out the dough without it sticking to the rolling pin & without using any extra flour (this can toughen your cookies). You'll notice I don't use too much raspberry jam on the cookies. I spread just enough to sandwich them and not have a mess. What I love about this picture, even though I didn't use it for my blog post, is that it shows you the underside of the wafer cookies. The bottoms are not browned or burnt! They're just right. This was a photo from last year. Since these cookies taste so good with just about any jam, I used blackberry for this batch. Delicious! Who can forget these morsels? I make them several times a year because they are positively tasty and everyone loves them. I've told you how they're my brother Erik's favorite cookie and it's no wonder why. This closeup picture shows you just how puffy & delectable they really are. Can you see the chock-full of Good Things they contain? Make a batch of them this weekend. They're bound to become a family favorite! This was a photo I didn't use for my post. I found it a bit sterile and not very well thought out. If you blog or photograph on a regular basis, you'll understand that it takes many shots from a camera before you find "the one". The soup, however, is out of this world. It's a soup I make quite often and to be honest with you, I've even used canned butternut squash puree in a pinch. If you want to make it from scratch (my favorite way), then by all means make your Roasted Butternut Squash and treat your family to it. Here's another shot I loved, but didn't use. On this counter I have my favorite Pillivuyt bowls (they're actually meant for cafe au lait) ready to be filled with a serving of soup. The spoons are American silverplate. I have to be honest with you, this shot was purely by accident. My counter was overrun with dishes and other items that I couldn't put away at the time and I was sauteing onions, peppers, bacon, peeling garlic and bringing my beans up to a boil. When it was time to remove the ingredients from the pan, I panicked! I quickly reached for one of my old ironstone platters and voila, the photo took shape. I'm rather pleased with the results. By the time the stew was done, everything was much calmer. I sat down to a bowl of the stew, pulled out a generously-sized silver spoon and a dark green cotton napkin, then I sat down to eat & reflect. This photo was taken at about the time of day I usually call my mother for one of our daily chats. The stew is so my mom. I love her! At the end of October I decided to dedicate a page to the Martha by Mail catalog. It was a catalog I had always admired and one that I will always cherish, along with the many products that I managed to buy from them. The picture above, shows a sticker that was placed on a sheet of tissue paper for one of their many shipments. I hope you find my Martha by Mail posts useful & informative. There are many more to come in the future! I love the sticker so much that I have my own "private labels". These get placed on the many baked goods I love to give away to friends & family. Ask any one of them and they will tell you that this particular sticker is a familiar sight throughout the year. My Good Thing for those I love most. The pictures for this post speak for themselves. Here are a few more shots that I didn't include. The picture above is taken from the front porch of our home. I'm looking out onto the winding driveway with the barn on the right hand side. The maple right in front is just changing. This uprooted tree was the result of the torrential rains we experienced during the summer. It's an amazing thing to witness firsthand and the sound of trees snapping & falling around the property is indescribable. Majestic trees with various shades of greens, yellows & reds set against a verdant field. This maple tree at the edge of the road had a wonderful two-tone color. Simply amazing! I introduced to you Chef Cyndi at the beginning of November. What I didn't tell you is that she and I, along with her brother & sisters, grew up together in Texas. Our friendship goes back a few decades, so this posting was close to my heart and I'm glad I was finally able to do it. 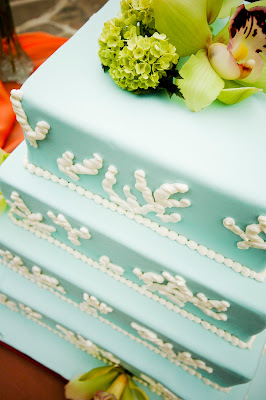 The coral wedding cake, pictured above is simply breathtaking; I can never get enough of robin's egg blue! 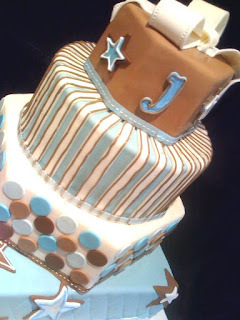 This adorable Stadium Cake wasn't included in my blog post, but I had to include it in my Remembering. How adorable is this? Can't you just picture one of these cakes for the little baseball fan in your life? Here's another beautiful, whimsical and delicious cake in blues & browns. So artfully presented. 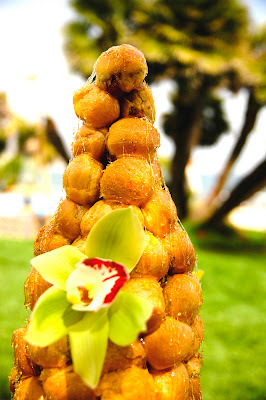 A closeup of her croquembouche. Don't you just want to pull a few of these puffs from looking at this confection? This is one of my favorite blog posts in recent months. I've held on to several of these little booklets because, not only are they very collectible, they're also quite informative. Go to my blog post and sift through the useful information found there. You're bound to learn many great things for creating one-of-a-kind cookies. I hope you enjoy reading it if you haven't already! The picture, above, shows an oversized bunny & egg cookie (these cutters will be a future post! ), along with a poodle & that penguin from the Noah's Ark Cutters ~ Set II. Thank you Martha Stewart Living Omnimedia for this little jewel. Why had I not come across a recipe for pomegranate cookies before? These cookies came about one day when I was going through my pantry & discovered a jar of half-used pomegranate molasses. I realized that one could easily use it to make cookies and so I went to work. The dough itself produces a shortbread cookie (no eggs) with a delicate richness. I also wanted to make use of my little molds (above) from Fante's in Philadelphia that I hadn't used. Look for them the next time you find yourself at that store. The end result is a delicate cookie that hints at pomegranate. Try these little not-too-sweet morsels for the holidays. I hope you love foggy mornings as much as I do. Whenever I wake up to fog around the house it always seems to make everything a lot calmer and a lot more serene. When I walked out of my house to snap these pictures I was greeted by a flock of crows nearby. It added to the ambiance. The photograph above shows the beginning of the meadow. This is one of the paths that winds through the 4 acre field. I can't get enough of these trees! That old oak stump that I love. I wonder what it must have looked like when it was still alive. I'm standing behind the barn here looking at those beautiful dogwood trees that have turned a dark red. Such a beautiful autumnal shade. This picture shows the cutters sitting on a blue-green floor in one of our spare bedrooms. I had to inspect them before my story to make sure they were "fit" for pictures. The box which has two notches to hold the cutter handles was cleverly made for Martha by Mail. If you own these types of cutters, keep the boxes and all of the literature. This will make your set more valuable to a collector. I love making this pudding every single year. There's something comforting about the aroma that emanates from my kitchen whenever I steam one or two on my cooktop. I have yet to find someone who will turn away a slice of my Holiday Persimmon Pudding. Make one this month for your family & friends, you won't regret it! There's still time to bake these delicious Pumpkin Custards. Don't hesitate to make a batch or two of them the next time you want to have an easy, yet elegant dessert at the end of a special meal. I think the next time I make these custards I may in fact use my white bone china cups (they seem durable enough). By the way, if you want to experiment with the recipe, you can certainly try using honey instead of maple syrup or heavy cream for the evaporated milk. Look at me, I'm making myself want one of these right this very minute just describing & looking at my own picture. I have to go, but stay tuned this December for many more Good Things to come! As we celebrate across America with family and friends this Thanksgiving, I hope everyone has a joyous holiday. May it be filled with many Good Things! Smooth, silky, pleasantly spiced and very much of the season, Pumpkin Custards are absolutely delicious. Everyone seems to be in such a rush around Thanksgiving to bake & roast the perfect meal, that many seem to take dessert for granted. This doesn't have to be the case if you arm yourself with a good, reliable recipe that is fool-proof and full of the season's flavors. One of the added benefits about my custards is that they are absolutely gluten-free! Several of my friends have a gluten intolerance but still crave the flavor of pumpkin pie. For them, my Pumpkin Custards are just the thing to eat. Yes, they're also a Good Thing for those who claim they don't have time to make & roll out a pie crust (even for those who are too timid to make a homemade pie crust!). These little custards can be whipped up the day before the feast and be kept in the refrigerator until dessert time. I think once you taste how utterly delicious my custards are, you're going to be tempted to make them time & time again. Let's start baking! Equipment: 8 ramekins or custard cups with a 4oz. (1/2cup) capacity. Bring a teakettle to a boil﻿ and find a roasting pan or baking pan that can hold all of your ramekins with space in between them. Whisk your eggs in a medium-sized bowl. Sift the spices, salt & cornstarch over the beaten eggs. This will help prevent the spices from clumping in your custard. A very Good Thing. Whisk until completely combined. Add the milk and vanilla extract; whisk to combine thoroughly. With the same sifter, strain the light brown sugar into the custard to remove any lumps. If you find small bits of hardened brown sugar that won't go through the sifter, discard them. You can push the brown sugar through the strainer with a whisk, but it's much easier to use a spatula. Don't forget to scrape the bottom of the sieve! Now whisk in the maple syrup (or honey). Add the pumpkin puree and mix until the custard is smooth. Voila! The fragrant, spicy Pumpkin Custard ready to be portioned out. With a 4 oz. ladle, portion out the custard evenly among the 8 ramekins taking care not to dribble down the sides of the cups. The ramekins are sitting inside a roasting pan and are staggered, giving them plenty of room. Carefully pour enough boiling water into the pan so that it comes halfway up the sides of the ramekins. Don't let any water fall into the cups. Bake in the oven for 45-50 minutes. The custards should be set and not wiggle. The tops may brown slightly and may even puff up a little. Upon cooling they will settle. Remove them from the water bath and let them cool completely on wire racks before serving. I prefer a cold custard, but they can certainly be served at room temperature. Bring them to the table & watch them disappear! A most creamy custard. Delicious. Simple to make and bake, and positively scrumptious to eat, my Pumpkin Custards are sure to please everyone at your Thanksgiving table. Don't forget to provide some sweetened whipped cream or a bit of crème fraîche for each serving, but remember, only one custard per guest. I know, who am I kidding, right? There are those who will insist on seconds, so I strongly advise you to double the recipe if you wish. Just make sure you have enough custard cups (teacups can be used in a pinch!) and plenty of spoons. I want to wish everyone a safe & wonderful Thanksgiving. May you be surrounded by loved ones, delicious food and lots of good cheer Enjoy! I love persimmons and as soon as I spot them at my local supermarket, I buy several. Since I'll be making a steamed pudding with them today, I thought I'd repost the recipe for my Persimmon Holiday Pudding. It's worth revisiting. Enjoy! This steamed pudding, which originally came from a Martha Stewart Living publication, has been in my repertoire for about a decade now, and every year I seem to tweak it a little to make it more suitable to my tastes. It has become a tradition to make at least one of these for our guests during the holidays and at least one or two to give away as a gift. Even those who claim not to like persimmons, will be quite surprised at how delectable this dessert really is. It reminds me of a plum pudding, which is very traditional for the holidays in Great Britain. Why not try making one this season? I came across these beauties at my local farmer's market. Can you blame me for buying them? The most common persimmons are Fuyu and Hachiya. Fuyu persimmons are shaped like a squat tomato and are ready to use even when they are firm to the touch; the skins must be peeled. Hachiya are more tear-shaped (pictured above) and must be soft before they are edible or they will be astringent. There is a native persimmon that grows in the Midwest and South that many people swear by. Use whatever you like. Start by placing a small round cake rack at the bottom of a deep stockpot (the pot should be wide enough to accommodate your mold or bowl with about a 1" clearance all around). This pudding can be made in a traditional pudding mold or in a heatproof bowl. Fill your pot with water so that it comes up at least halfway up the sides of your mold. Turn on your heat and bring it to a boil. In a small saucepan, heat 1/2 cup cranberry juice. Pour over 1/2 cup chopped dried cranberries and let macerate for 10 minutes. Drain & reserve 1 tablespoon. Note: you may substitute other dried fruit, but use the same amount. Slice the tops of 2 large persimmons. Slip a large spoon under the skin and scoop out the flesh. Cut the fruit & puree in your food processor until smooth. If you notice any seeds, remove them. You should have 1 1/2 cups puree. Note: you can mash this up with a pastry cutter if you don't have a food processor. I'm using the new paddle attachment (right) for my Kitchenaid. This has built in scrapers which reach up the sides of the bowl. Cream your butter and sugar well until it is very light. This should take you about 3 minutes or so. Add your eggs one at a time. You want the butter and sugar to absorb the eggs completely before adding the next one. If you don't have one of the new paddles, stop your machine and scrape down your bowl at least once or twice. This is very important. Add the reserved cranberry juice. At this point you should also add your vanilla. Sift your dry ingredients into a large bowl using a sieve. I know most people nowadays sift by using a whisk, but for this pudding, I use a sieve. ﻿Add your pureed persimmon on low speed. Mix well. In a small bowl, combine your hot water and baking soda. Add this to your mixture. Add your dry ingredients next. Mix this in 3 additions, alternating with the milk. Incorporate these on low speed. You don't want to have a snowfall of flour on your counter. The milk being poured down the side of the bowl. Finally add your dried cranberries. I used Pam with flour to prepare my mold. A more traditional approach would be to butter the vessel. A steamed pudding mold like this one should come with a lid, so spray/butter that too. However, if you're using a pudding bowl, cover it with a piece of parchment and wrap it in a piece of foil. You can secure it with a large rubber band or tie it with kitchen twine. Fill your pudding mold and scrape ever bit of batter. I'm using a 2 qt. mold. Carefully lower your pudding into the simmering water. Steam for 2 hours and 15 minutes. From time to time, check the water level and make sure it stays halfway up the sides of your mold. If you find the water level below the midway point, add boiling water to the pot and continue steaming. It's very important to maintain a simmer and NOT a boil. After the pudding is done, remove the mold carefully and cool on a rack for 15 minutes undisturbed. 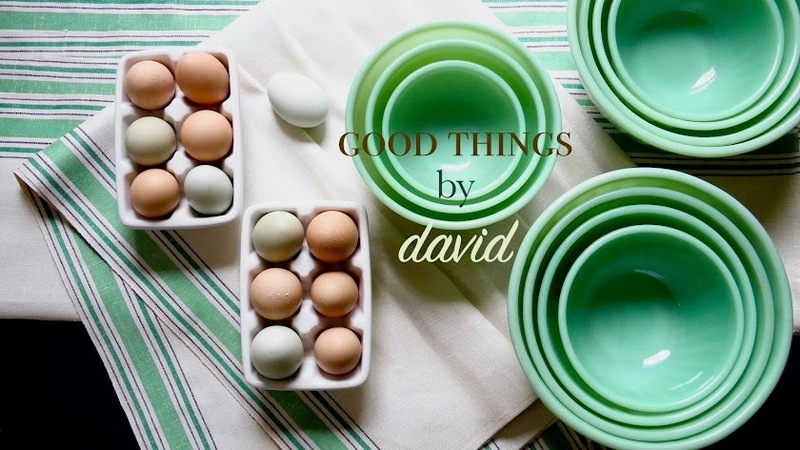 Find a nice cake stand or serving plate and unmold it. This one sits atop an antique pressed glass cake stand. The pudding is quite fragrant and exceedingly moist. 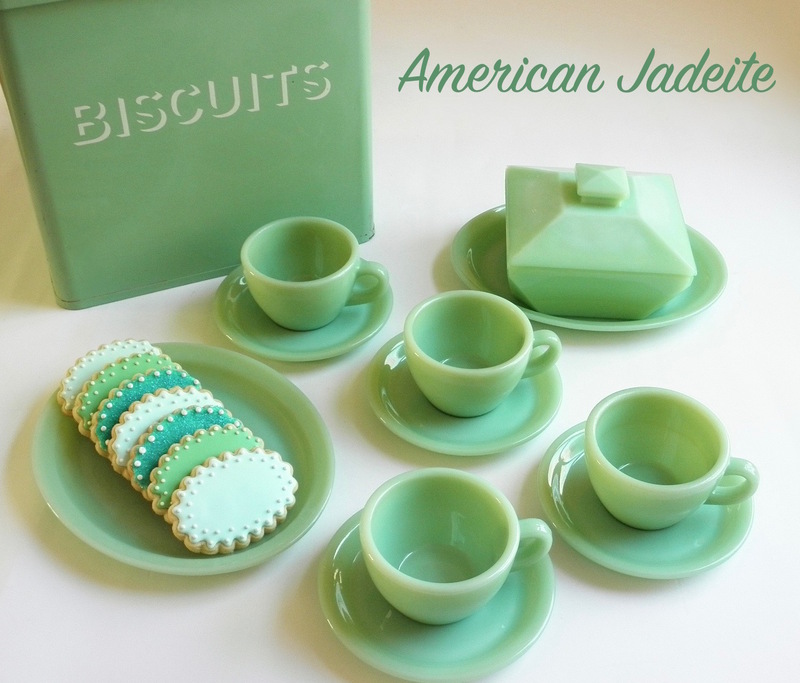 I'm using some my favorite pieces of gilded Wedgwood drabware to serve tea & a generous wedge of the pudding. The napkin is woven Russian jacquard.